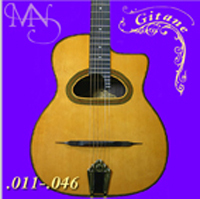 Gitane Jazz Strings are individually handmade from the finest materials available, and wound to give the authentic tone and feel of the acoustic gypsy jazz guitar. Compatible with all pick up systems, these strings are not restricted solely to acoustic use and a smooth warm tone can be expected on all guitars. .011, .015, .020, .028, .036, .046.